Who couldn't use a little more prosperity? 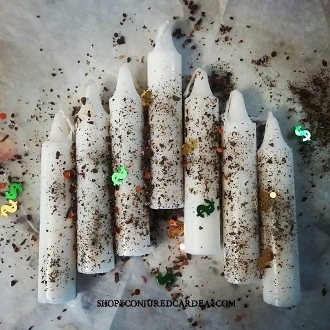 These lovely, 4 inch candles have been dipped in my signature myrrh and cherry oil blend, then rolled in hand-crushed myrrh, pyrite (fool's gold stone), clove, basil and a few other hand-prepared secret ingredients. All of this and then charged by me to get you the best results...just add you! Sure to bring you all the prosperity, fertility, abundance, and wealth you could deserve! Wonderful scent! Stock up, they're a super deal! You will receive 7 candles, after all, 7 is the luckiest of numbers! Try anointing these and a green mojo bag with my "Bani" or "Gypsy Gold" oils for super charged success! Thanks for looking! Herbs can ignite. As with any candle, burn only with supervision. curio only.